The AGM-88E advanced anti-radiation guided missile (AARGM) was fired from an F/A-18 at China Lake during development phase. Image courtesy of Naval Air Systems Command. The AGM-88E advanced anti-radiation guided missile (AARGM) being fired from F/A-18C/D, FA-18E/F, EA-18G, Tornado IDS/ECR aircraft. US Navy photo by Greg L. Davis. 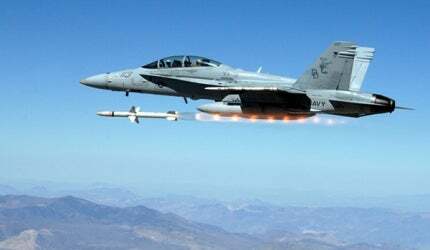 The AGM-88E Advanced Anti-Radiation Guided Missiles (AARGM) integrated with an F/A-18F Super Hornet. US Navy photo by Greg L. Davis. An F/A-18F Super Hornet conducts a captive carry flight test of an AGM-88E Advanced Anti-Radiation Guided Missile (AARGM) at Naval Air Station Patuxent River. US Navy photo by Greg L. Davis. The AGM-88E AARGM is a medium-range air-to-ground missile developed by Orbital ATK (previously Alliant Techsystems). The primary role of the missile is to target enemy air defences. The missile can engage relocatable Integrated Air Defence (IAD) targets and other targets equipped with shutdown capability. The AGM-88E AARGM is a follow-on to the US Navy’s AGM-88 High-Speed Anti-Radiation Missile (HARM). It was the only tactical extended-range, supersonic, multi-role strike weapon in the US and Italian inventory when operational in 2012. In September 2012, Orbital ATK received a $71m contract from the US Navy for the full-rate production of the AGM-88E AARGM. The US Navy received the 100th AARGM from Orbital ATK in September 2013. It awarded a $102.4m contract to ATK for the second full-rate production of AGM-88 AARGM for the US Navy and Italian Air Force in October 2013. The contractual scope also includes the supply of Captive Air Training Missiles (CATM) for the US Navy, Italian and Royal Australian Air Forces. ATK received a $96.2m contract from the US Navy for the third full-rate production of the AARGM in August 2014. In September 2017, the US Navy placed a $350m contract with Orbital ATK for the sixth full rate production (FRP) of AARGM. The Advanced Anti-Radiation Guided Missile (AGM-88E) is deployed by the US Navy, US Marine Corps and Italian Air Force. The AARGM was developed under a US and Italian joint acquisition programme led by the US Navy. The AARGM Advanced Technology Demonstration (ATD) Small Business Innovative Research (SBIR) Phase I commenced in 1990. The second and third phases began in 1991 and 1995 respectively. In June 2003, Orbital ATK received a $223m contract to develop the AARGM. In November 2005, the Italian Ministry of Defence and the US Department of Defence signed a memorandum of agreement for the joint development of the AGM-88E AARGM. An MOU between ATK and MBDA was signed in July 2007 to evaluate possible work share opportunities with the German Ministry of Defence on the AARGM programme. The missile was granted Milestone C approval for Low Rate Initial Production (LRIP) in September 2008. The Independent Operational Test and Evaluation (IOT&E) commenced in summer 2009. The hardware and software deficiencies discovered in developmental testing and during its first IOT&E attempt in Q4 2010 were corrected during developmental testing. An integrated developmental / operational test (IT) period was concluded by July 2011. An operational test readiness review was conducted by The Operational Test Authority in July 2011. By September 2011, the US Navy completed 40% of planned operational test flights, accumulating over 150 hours of missile operating time. It fired a total of four missiles at actual and simulated threat targets and emitters during the IT and IOT&E in 2011. AARGM’s system maturity and reliability were checked in more than 200 Beech King Air flight tests and 58 Captive Carriage FA-18 tests conducted against a wide range of targets. In January 2018, the US Navy contracted Orbital ATK for the extended range version of AARGM, Advanced Anti-Radiation Guided Missile-Extended Range (AARGM-ER). 27 Ticonderoga class (CG 47 – CG 73) Aegis guided missile cruisers were built between 1983 and 1994 by Ingalls Shipbuilding (now Northrop Grumman Ship Systems) at Pascagoula, Mississippi and Bath Iron Works (a General Dynamics Company), Bath, Maine. The AARGM incorporates a new guidance section and modified control section combined with Rocket Motor and Warhead Section, wings and fins of HARM. The missile uses a multi-mode seeker to counter enemy shut-down capability. The fire and forget capability of the missile allows weapon engagement at sufficient stand-off ranges. The Weapon Impact Assessment (WIA) subsystem supports battle damage assessment decisions by transferring impact assessment data prior to an impact. The missile has a length of 417cm, diameter of 25.4cm and a wingspan of 112cm. The weight of the missile is 361kg. It can intercept targets within the range of 60+ nm while travelling at a speed of Mach 2+. The AARGM can be integrated on the FA-18 C/D, FA-18 E/F, EA-18 G, and Tornado ECR aircraft. It is also compatible with F-35, EA-6B, and F-16 aircraft. The AGM-88E is equipped with an advanced multi-sensor system comprising a Millimetre Wave (MMW) terminal seeker, advanced Anti-Radiation Homing (ARH) receiver and Global Positioning System / Inertial Navigation System (GPS/INS). The system can quickly engage traditional and advanced enemy air defence targets, as well as non-radar time-sensitive strike targets. The missile receives tactical intelligence information through an embedded Integrated Broadcast System Receiver (IBS-R). The IBS delivers situational awareness information and second source confirmation for the war-fighters. The missile transfers real-time weapon impact assessment reports. It offers extended-range engagement, as well as organic, in-cockpit emitter targeting capability, and situational awareness. The AGM-88E AARGM is powered by an AGM-88 rocket motor using a Thiokol dual-thrust solid propellant.